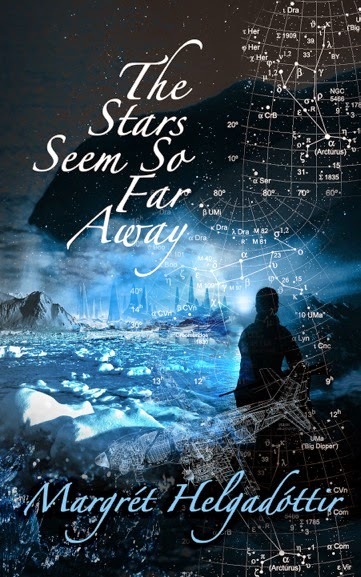 Valeria Vitale (for The Future Fire): Let's start with your debut book, The Stars Seem So Far Away, a collection of interlinked tales published by Fox Spirit. What is this book about and what do the five main characters have in common? Margrét Helgadóttir: My intention was to give the readers glimpses, like pieces of a larger puzzle, or short film clips. The Stars Seem So Far Away is not a collection of stories, but it’s not a novel either. It’s a hybrid, a fusion of linked tales that together tell a larger story, set in a distant apocalyptic future, where plagues, famine and wars rage across the dying Earth. The last shuttles to the space colonies are long gone. Fleeing the deadly sun, humans migrate farther and farther north. I strongly believe in telling broader, more universal stories through the eyes of people who struggle with their own nightmares and personal stories, so this story is told through the tales of five people: One girl who sails the Northern Sea, robbing other ships to survive; one girl who guards something on a distant island; one guerrilla soldier; and finally, two refugee siblings who become separated when the plague hits Svalbard. They all try to survive on their own in a cold world where everything seems hopeless. It is a pessimistic world, filled with death and despair, but I wanted to tell a story where there’s also hope, love, laughter and friendship. I hope I have succeeded in this and that people will like the stories and the characters. 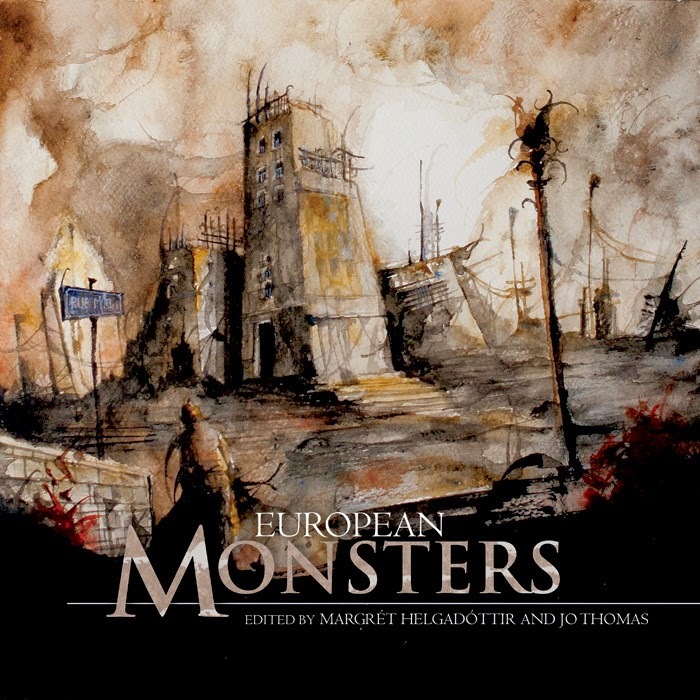 VV: You have also co-edited with Jo Thomas the first volume of a series about monsters: you recently published European Monsters, and are also planning the follow-up, African Monsters. Is there something that particularly struck you in how the imagery of monsters changes across different countries and cultures? Typically, monsters are used to embody nature and the wilderness or natural powers, to explain the existence of things that were made, such as rock formations; or to blame for when things go wrong. So, the individual monsters might not be universal, but the idea of what a monster is and their origin is. It’s a very exciting book series to work with and I am excited to see the stories we now receive to the Africa volume. 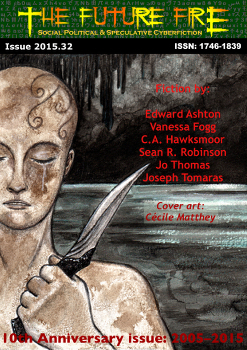 VV: A call for submissions for another Fox Spirit anthology titled Winter Tales has just opened. Do you think there is something that makes winter in the northern countries particularly fascinating and/or terrifying? MH: I have lived in a few African countries, and despite what people think, you do have winter seasons in Africa as well. The temperature drops, the ocean becomes cold and in some parts, like Addis Ababa or South Africa, it can even snow. That said, I adore the winters in the northern world, but that’s probably because I have lived here huge chunks of my life, so I have learned to look beyond the snow and the freezing cold. When it feels like the ice pierces through everything, including yourself, and you want to escape it, but you can’t, the northern winters might seem harsh and extreme. Personally I struggle mostly with the winter darkness. We have sun and daylight only for a short while during the winter season. All you want to do is sleep, and we joke about going into hibernation like animals do. But I think there is beauty and magic. The pure white snow covers everything, chasing away the dark. The northern light dances green in the sky. And everything is so, so quiet. Candles are lit to chase away the darkness and people huddle up together in front of fires to share warmth, food, music and stories. It’s an important part of the culture and history of the northern and arctic countries and the different people who live here. Many of our stories and folklore have been created and shared in settings just like this. Just as I’m sure stories have been told in front of the fires in the cold seasons in other parts of the world for hundreds of years. And this, to me, is part of the magic of the winter seasons. 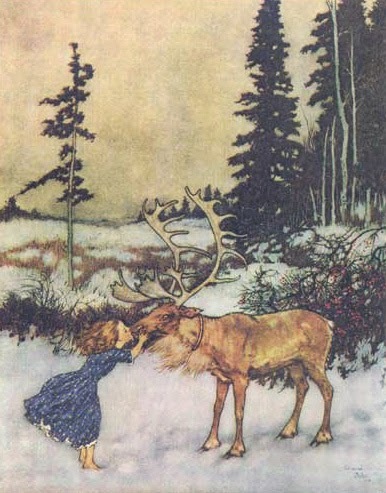 E. Dulac's illustration for H. C. Andersen's Snow Queen. VV: In your experience as an editor, what makes a story stand out? What kind of stories would you like authors to submit to the winter anthology? MH: In my view, the stories that stand out usually have a strong writing voice and a natural narrative flow. They don’t have to be long. I’ve read flash stories that impressed me more than novellas. Language is to me part of the reader experience, and I will enjoy a story even more if the language is polished and the story is proofread. Other than this, it’s difficult to say what makes me read a story twice. It can be a feeling in the story, a convincing character development, or an original setting. The Winter Tales anthology will be a speculative fiction anthology, so I want fiction stories with full plot and strong characters within these genres. Stories about creatures, monsters, animals and shapeshifters are welcome. I seek and encourage diversity in literature, so I hope to receive many stories written by and/or about characters from all over the world, all genders and orientations. But I ask that the stories must be written in English, take place on Earth and have the winter as frame. Poetry is also welcome. For more details, read our submission call.